Editor&apos;s note: This story has an addendum that addresses a follow-up question we received via a comment. The current article addresses chemicals that are of concern to environmental agencies and that affect issuance of fish consumption advisories. The addendum addresses additional chemicals of concern. Steve Ediger says he’s not an avid fisherman, but he has cast a few lines. When he was growing up, his grandfather would take him fishing in Lake Geneva, Wisconsin. Ediger suspects Lake Michigan fish aren’t entirely safe to eat, and he’s not alone. With major cities and industrial centers like Chicago, Milwaukee and Green Bay along its shores — as well as the refineries of Northwestern Indiana — Lake Michigan is no stranger to pollution. To find out just how much of the stuff ends up in the fish we pluck out of the lake, I asked a few people with different angles on the situation. Turns out a lot of work goes into monitoring and disseminating information about contaminants in Lake Michigan fish. We find out which are most worrisome to fishermen and toxicologists, but also why you shouldn’t let that scare you off eating fish entirely. I put the question to someone who handles Lake Michigan fish every day: Joel Reiser, captain of the Chicago charter boat company Brush And Roll. “Pretty much everything is edible in Lake Michigan with moderation,” he says. Reiser brings up to six people on chartered fishing trips in Lake Michigan, leaving from 31st Street Harbor. They catch chinook salmon, coho salmon, lake trout, rainbow trout, and brown trout. His crew cleans and bags up to five fish per customer (only two lake trout), which they can take home to eat. With stories of polluted waters swirling, Reiser watches out for government-issued fish advisories and eats seafood in moderation. But he says fish from any waters can contain contaminants. It turns out, Reiser’s basically right. In casting about for an answer to Ediger&apos;s question, we found out Lake Michigan’s pollution problems aren’t the whole story. The horror stories are overblown, but they’re rooted in truth. Tom Hornshaw, a toxicologist with the Illinois Environmental Protection Agency’s “fish contaminant monitoring program,” helps gather data that goes into those government advisories. Since 1974, the Illinois Department of Natural Resources and IEPA have nabbed fish (mainly bass, channel catfish and carp) from 500 locations in Illinois for contaminant testing. I asked Hornshaw point-blank: Is it safe to eat fish from Lake Michigan? If you’re wondering what Captain Reiser meant by “moderation,” you might start with the general fish consumption advisory from the Illinois Department of Public Health. ” This applies to lake-caught carp and channel catfish. The advisories vary based on the fish’s size, in some cases. Take the yellow perch, Perca flavescens. Fish less than 11 inches long, the Illinois DNR says, should be eaten at most once per week. But you should only eat perch larger than 11 inches once per month. Likewise lake trout, a popular sport fish can that grow up to three feet long, carries three tiers of advisories: less than 25 inches? One meal per month; 25-29 inches? Six meals per year; larger than 29 inches? Do not eat. If you fish in Wisconsin, use that state’s online query tool to check on the water you’ll be fishing. Indiana, too, updates its fish consumption advisories online. PCBs: What’s all the fuss about? One of the major culprits are a group of chemicals known as PCBs. Polychlorinated biphenyls are a group of man-made chemicals useful in a variety of industrial processes, including the insulation and cooling of electrical equipment. EPA banned their use in 1979, after it was widely recognized PCB pollution had caused skin conditions and immune system disorders. Studies have also linked the chemicals to cancer. We produced more than one billion pounds of the stuff in the U.S., about half of which made its way into the environment. But PCB pollution continues long after its source is cut off. PCBs still find their way into the Great Lakes through a process called atmospheric deposition. They travel around the world through the atmosphere, falling out of the sky at high latitudes. That’s why scientists have found high levels of the stuff in the Arctic, thousands of miles from the factories that pumped out PCBs in the 1970s. At this point Hornshaw, the EPA toxicologist, says atmospheric deposition is probably the primary source of PCBs in the Great Lakes. He says there’s a simple, one-word answer for what it will take for Lake Michigan fish to become safer for consumption. 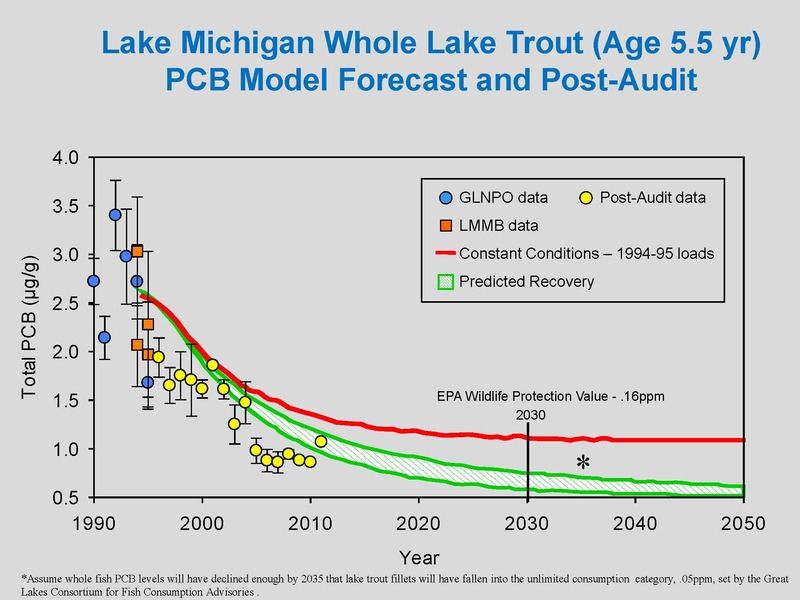 The graph suggests that by 2035, assuming progress continues, you should be able to eat all the Great Lakes lake trout filets that you want without fear of PCBs. Lake and river sediments are especially good at holding onto PCBs, so bottom-dwelling fish tend to have higher levels (hence the “Do Not Eat” advisory on carp and channel catfish in Lake Michigan). PCBs also accumulate in fatty tissues, so it’s important to filet wild-caught fish properly before eating them. PCBs aren’t very soluble in water, so swimming isn’t going to result in dangerous exposure. It turns out Captain Reiser’s suspicion that government agencies were covering “their own tail” is correct. “The advisories may be overprotective for women beyond childbearing age and for adult men,” reads an FAQ from the Illinois Department of Public Health. That’s especially true for mercury — a potent pollutant found in fish from Lake Michigan and around the world. Fetuses, nursing babies and young children are especially vulnerable, so the advisories are drafted with a low tolerance for risk. Mercury can severely hinder development of the fetal nervous system. EPA found mercury levels in women of childbearing age dropped 34 percent from a survey conducted in 1999-2000, but it’s still a concern. Pat McCann, a fish advisory specialist with Minnesota’s Department of Public Health says it’s important to keep in mind the big picture. A lot of people swear off fish altogether, but McCann says that’s actually counterproductive. Take the group of people most sensitive to mercury contamination: pregnant women. Mercury impairs neurological development in fetuses. But the McCann says that doesn’t mean women should avoid all fish entirely. Concentrations of mercury and PCBs are above guidelines for walleye and lake trout in all of the Great Lakes. Mercury levels were getting worse in Lakes Superior, Huron and Erie when EPA and Environment Canada released their 2011 "State of the Great Lakes" report. One place you’ll find Great Lakes fish on sale in Chicago is Market Fisheries at 7129 S. State St., in the Greater Grand Crossing neighborhood. They’ve been owned and operated by the Brody Family since 1957. Curtis Alexander, the market’s manager, shows me around. The market’s busy. People pull numbers and step up to order catfish or perch, while an employee behind the counter scales and hacks up fish. Alexander says their suppliers are mostly based in Canada, so they don’t sell Lake Michigan fish. But they’ll gladly clean your catch. No one brings in fresh-caught fish from Lake Michigan while I’m there. But trout fishing season in Illinois starts April 5, and Alexander may have new customers soon. IDNR added four new areas for rainbow trout fishing this year, including Chicago’s Wolf Lake—one of two hunter-friendly oases in the city proper. Our question-asker, Steve Ediger, knows a few people who might take advantage of that new fishery. In an informal survey of his fishing friends, Ediger found that concerns over PCBs and mercury aren’t deal-breakers for avid anglers. Mercury and PCB pollution are problems for fisheries all over the world — not just Lake Michigan. Clean-up efforts here have come a long way, but new pollutants could set us back. A BP refinery in Northwest Indiana came under fire last year when it missed a federal deadline to put in place new pollution controls for mercury (state regulators gave them an exemption). And if the threat of invasive species like Asian carp proves as devastating as some studies predict, Great Lakes fisheries could collapse whether or not we continue to clean up the water. So, a corollary to Tom Hornshaw’s one-word answer to our question: What will it take to make Lake Michigan fish safe to eat? Time, and our attention. Mercury and PCBs are the major chemicals that Illinois’ state EPA tests for and regulates, but there are other contaminants worth considering. More recently, Great Lakes environmental agencies have tracked the dilution of another potentially harmful contaminant. A group of flame retardant chemicals known as PBDEs (polybrominated diphenyl ethers) were phased out starting in 2004. Measurements by Environment Canada show declines in PBDE concentrations across the Great Lakes, including Lake Michigan, but Illinois EPA doesn’t track PBDEs in fish. As toxicologist Tom Hornshaw explains, the reason isn’t lack of concern — it’s lack of funding. “Currently PBDEs are not addressed in our fish advisory program—our lab is not set up to do PBDEs and it would require purchase of an expensive piece of equipment to analyze for them,” Hornshaw writes in an email. It’s important to note in this addendum that the chemicals we’re phasing out now don’t disappear immediately. That’s why they call them persistent pollutants. PCBs, DDT and other chemicals in the Great Lakes are contaminants largely inherited from a time roughly 50 years ago. We have to wonder what legacy today’s garbage will have on future Great Lakes residents. Already tiny plastic beads pose a threat to fish health and environmental quality in the region. Chris Bentley is a reporter for WBEZ’s Curious City, and a freelance journalist. Follow him on Twitter at @Cementley.